There are a lot of products I write about and review for real living magazine. But only a few of those also make the journey home with me because I can't resist them (and they fit in with my decor). And this was the case with the bold and graphic tea towels from Poulier & Poulier. Here is one half of the clever design team, uber stylish Lisa Poulier. Which five words best describe you? Sensitive, loyal, emotional, impatient and optimistic. What was your first job and what path have you taken since then? My first job was working over the school holidays at Georges in Collins Street, sadly it no longer exists but at the time it truly was a Melbourne style icon and no doubt influenced my decision to study design. After finishing my degree in Graphic Design at Swinburne I was lucky enough to work for a number of leading studios before heading overseas. We started our family as soon as we arrived back in Australia and I made the decision then to freelance from home- which was a great solution as it allowed me to enjoy the best of both worlds. Recently I returned to study, this time in Interior Decoration and Design at RMIT. Juggling the course work and family life was challenging at times but extremely rewarding as it ultimately led to us launching our first range earlier this year. What's your proudest achievement? Obviously our three beautiful children - Lily, Tom and Bella. What's been your best decision? To go traveling with Mark to London where we lived and worked for a year, a fantastic experience! Who inspires you? Difficult to say as it changes constantly but at the moment I'm particularly loving the work of Ilse Crawford - her aesthetic is so elegant and understated. What are you passionate about? That would definitely be our next range. We're really excited about getting it out there! What's the best lesson you've learnt? Do what you love, don't compromise, just follow your heart. Which person, living or dead, would you most like to meet? Clive James, Paul Smith, Nigella Lawson, Billy Connoly, Sir Terrence Conran, the list goes on. What dream do you still want to fulfil? We'd love to see our work stocked internationally- that would be amazing. What are you reading? The Slap by Christos Tsiolkas - it's so Melbourne and even better the second time around. Also interiors magazines, stacks and stacks of interiors magazines. I’m currently reading ‘The Slap’ too — great book! 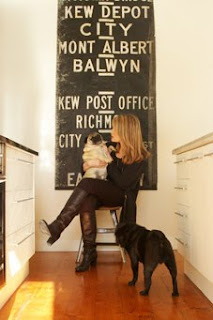 I have been eyeing off Lisa’s designs for a while now, especially the eye chart designs. 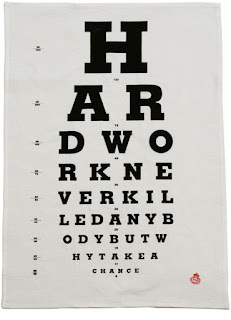 I have an Aunty Cookie eye chart cushion in my study (which you can see on my Flying Ducks blog) — perhaps one of Lisa’s framed tea towels would be a good accompaniment! Those images are fanastic, especially the last one. Hope that you have a great day. 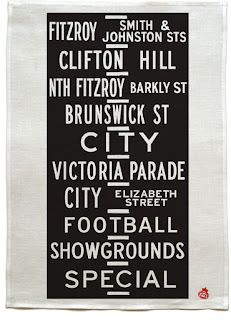 These are the best kind of Tea Towels I think, the ones you want to frame. These are great, anything typographic and I'm hooked. Really enjoying the old bus blind tea towel.